One Year! 52 weeks! 366 days (it was a Leap Year, remember?)! That's right, it's been a year since we were in the midst of one of the most fun and absolutely cutest quilt-alongs ever - Lori Holt's Farm Girl Vintage. And Lori is celebrating her anniversary with a fun new block! 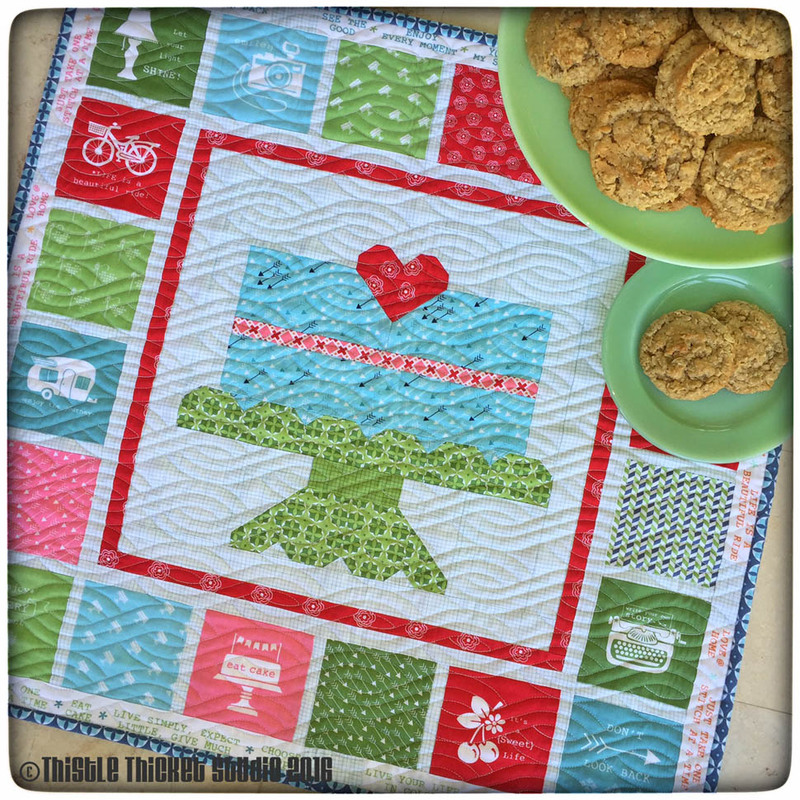 I was honored to be invited to help Lori celebrate by making this sweeter-than-sweet mini quilt using Lori's "Modern Minis" fabric line. 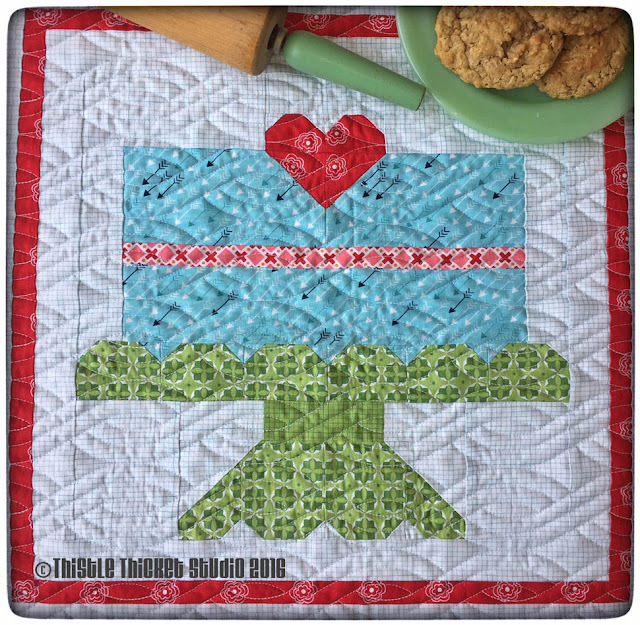 Visit the Fat Quarter Shop's blog for the free pattern for this Farm Girl Layer Cake block. 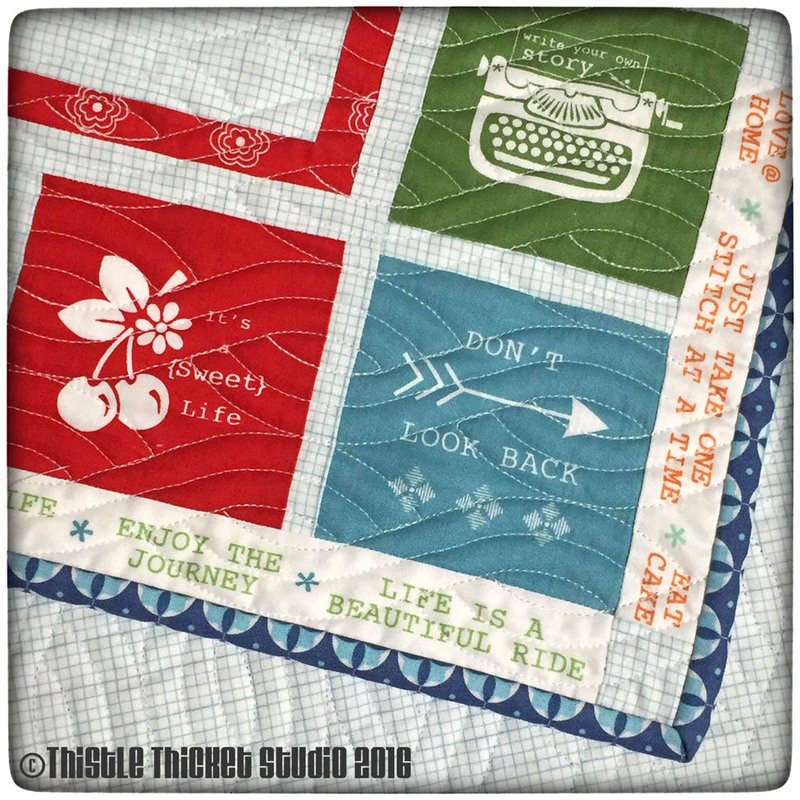 I used the squares from the patchwork panels from "Modern Minis" to make a border around my Layer Cake block, then finished it off with an outer border of the printed sayings from the panel selvedge. I just love the sayings! Thanks for stopping by this farm girl's blog! I love the layer cake and the water turn block quilt! How did you quilt the cable on the layer cake? They are both very beautiful!! Love your cake the best! So nicely done! I LOVE the way your block turned out!! I especially appreciate the quilting - nice job!! Wow... I just love the quilt you have made... the colors are really nice!! 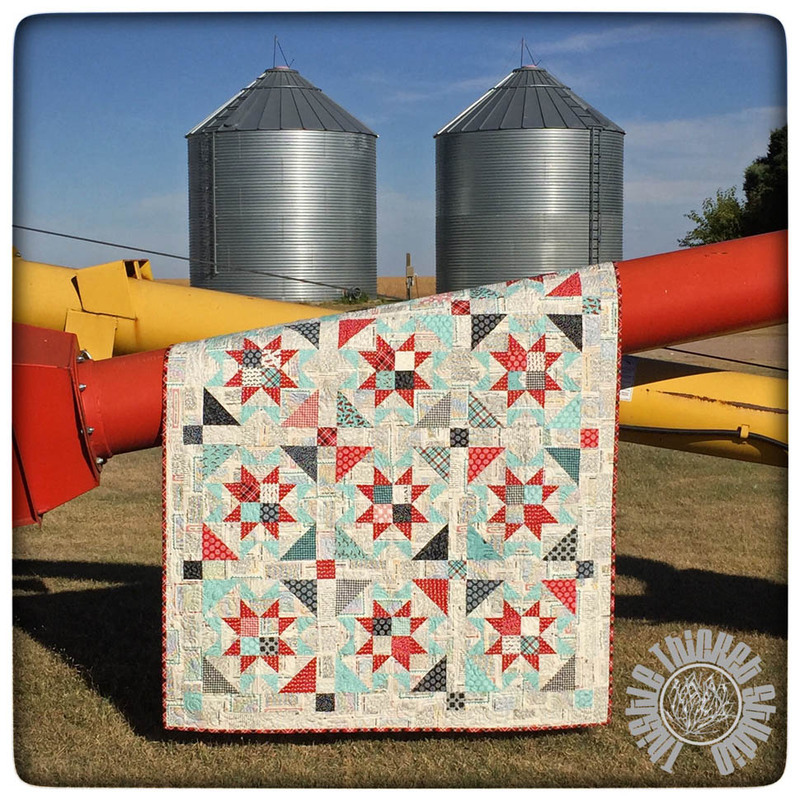 The water turn block quilt is beautiful! It's one of my favorite color combinations, and the photo setting is great! It was fun seeing all those Layer cakes pop up on instagram yesterday, only I didn't know why they were, until you explained it! Wow!! So glad I found you--saw your quilt on the fatquarter shop's IG feed. I am soooo following you now--I love your work!! I just finished up a small quilt using those sweet little blocks around the outside, but I still have so many left over just waiting for use...this is perfect!! I also used that graph paper print as my background fabric for that first quilt--I adore the way it looks! Your idea to use the cute little sayings as part of the borders is awesome. I am totally going to do that!!! My quilt will not be exactly the same as yours--but you have definitely inspired me to make another one!!! Thanks! !